In the early days, Hermosa Beach, like so many of its neighboring cities - Torrance, Lawndale, Inglewood - was one vast sweep of rolling hills covered with fields of grain, mostly barley. The immediate beach area of Hermosa was a collection of sparse-looking sand dunes seemingly 40 miles from nowhere. A steady wind whipping across the barren dunes made life miserable for the first hardy pioneers. One of them, Mrs. Dorcas Ingram, set down her views for posterity. "But my inmost being shrank from the greeting chill and dank of a wind forever blowing o'er the sand dunes of Hermosa." Many of the early settlers collected their own narrow planks and built precarious walkways between often-frequented spots. The hardier ones didn't bother -- they plodded through the sand. During certain seasons of the year, large herds of sheep grazed over the land further inland, and corrals and large barns for storing grain, as well as providing shelter for horses and farm implements, were located on the ranch between Hermosa and Inglewood. 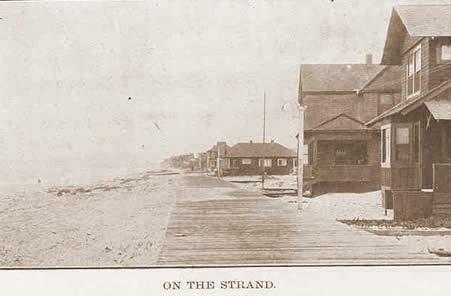 The first official survey was made in the year 1901 for the boardwalk on the Strand, Hermosa Avenue and Santa Fe Avenue. A short time afterward a record 500,000 feet of Oregon pine was installed along a mile and one-half of the Strand. This was duly recorded as a notable achievement by loyal Hermosans, but drew sneers from nearby Redondo residents who called it, "a walk to the middle of no where." The wood boardwalk was made of planks and extended the entire length of the two-mile Strand. High tides sometimes washed away portions of this walkway. In 1914 part of it was replaced with cement. The remaining two thousand feet on the north was completed in cement in 1926. In 1904, the first Hermosa Beach pier was built. It was constructed entirely of wood, even to the pilings. It extended five hundred feet out into the ocean. 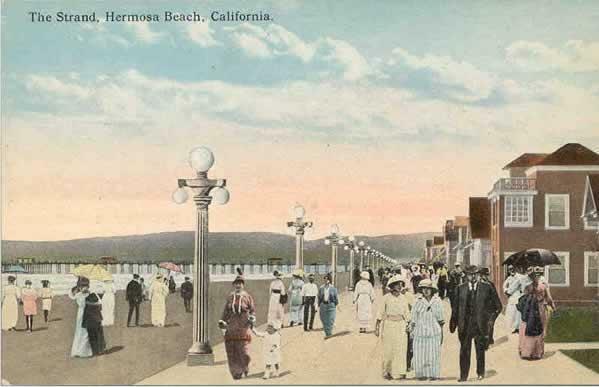 In 1914, Hermosa completed its second pier, a 1,000-foot concrete structure complete with small tiled pavilions along the sides to afford shade for fisherman and picnic parties. It replaced the 500-foot wooden effort that was washed out to sea a year earlier. Eventually, a bait stand was built out on the end. On Christmas Eve, 1906, Hermosa Beach held its first incorporation election and chose its first city officers. In the interest of accuracy its only fair to report that the idea of incorporating the city didn't get a resounding vote of confidence from an eager mob of voters. The final tally was 24 votes for, and 23 against.But resounding or not, Hermosa Beach was duly incorporated and received its charter from the state as a sixth class city on January 14, 1907. At that time, the city acquired ownership of its two-mile stretch of ocean frontage, this being included in an original deed to the city from the Hermosa Beach Land and Water Company. The deed stated that this land was to be held in perpetuity as a beach playground, free from commerce, and for the benefit of not only residents of Hermosa, but also for the sea lovers of Southern California. In 1914, an auditorium building was constructed. Over the years, it has housed various enterprises. Presently, it is used by the Los Angeles County Life Guard Service. Hermosa Avenue was the first street to be paved. 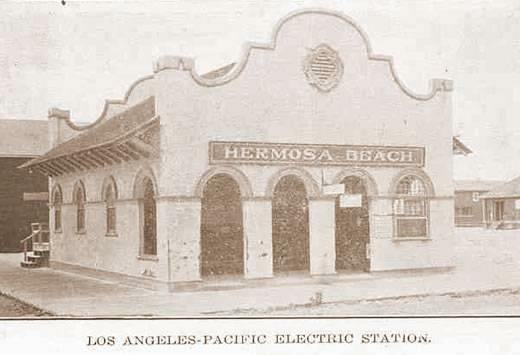 The Santa Fe railway was the only transportation system through Hermosa Beach. It was seven blocks from the beach. The street that led to the tracks was called Santa Fe Avenue, but was later renamed Pier Avenue. There was no railway station for Hermosa, but Burbank and Baker built a platform on the west side of the tracks near Santa Fe Avenue, and later the Railroad Company donated an old boxcar to be used as a storage place for freight. In 1926, the Santa Fe Company built a modern stucco depot and installed Western Union telegraph service in it. One of the most ambitious projects attempted in the city came in the mid-1920's with the opening of the building, which later became the Hermosa Biltmore Hotel. The Hotel was located between 14th and 15th Streets on the Strand. In those days it was the headquarters for the Surf and Sand Club, and was run on a private club basis. 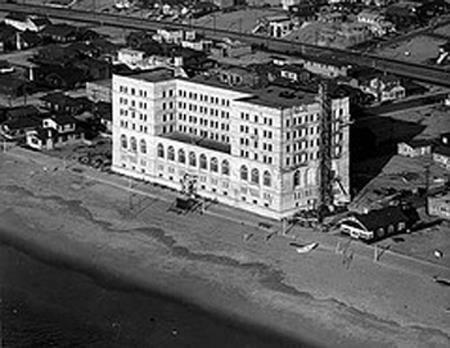 A number of wealthy persons backed the project and for several years the building, a notable achievement in those days, was the showplace and social center of Hermosa. The private club idea proved to be a losing proposition, however, and a few years later the founders and owners sold out to the Los Angeles Athletic Club. This group, with better financing, attempted to run the property on more or less the same basis but finally sold out to hotel interests about 1930. During World War II, for a short time the building was taken over by the federal government and used as a youth training center. This property was torn down in the late 1960's for development, and is now the site of a public park. 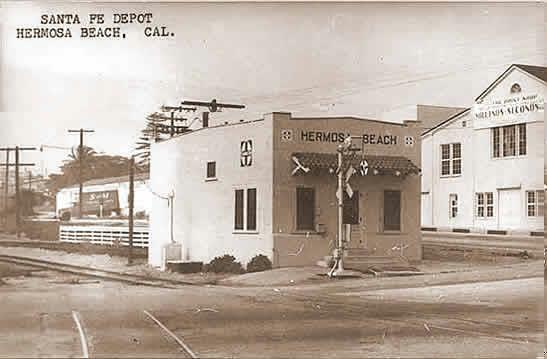 Other notable events in Hermosa during the mid-20's were the building of Pacific Coast Highway, and the opening of the Bank of America, at Pier Ave. and Hermosa Aves., and the Hermosa Theatre, which still occupies the same site on Hermosa Ave. across from the city hall. In the late 1940's and the 1950's, Hermosa Beach had, what at that time, was considered a state of the art Marine Aquarium - as reported in an article in the Daily Breeze in August 2006, the aquarium consisted of "giant glass-fronted tanks of the Ocean Aquarium just south of the pier and west of The Strand, drawing nearly 2 million visitors in its nearly 10-year run in town.Hermosa Beach's own mini Sea World stood just south of the pier where Shumacher Plaza now is -- or as the Daily Breeze put it in 1956: "Just walk to the foot of Pier Avenue and turn your feet to the right before they get wet. In front of you is a large gray building housing numerous specimen from the sea next door. It's the Ocean Aquarium." "The large blue building, which opened in 1947, was round, so visitors could walk in a circle along the building's edges, said longtime Hermosa Beach resident Terry Bose.The underwater zoo clocked about 1.8 million visitors, including more than 25,000 group tours from the Boy Scouts and other youth and school organizations." 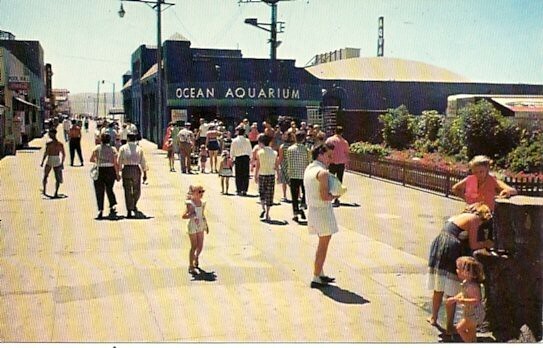 "While Marineland of the Pacific -- a descendent of Hermosa's aquarium, according to a book detailing Hermosa Beach's history in pictures -- entertained tourists on the Palos Verdes Peninsula for more than 30 years, the Ocean Aquarium wasn't nearly as lucky. By all accounts, the facility enjoyed barely a 10-year run.An apparent squabble between McBride and the city over a 40-year lease calling for the development of a new pier caused both parties to hire lawyers in January 1956." "According to a Breeze article, the city was offered the aquarium's land and several nearby parcels for $85,000 in June 1958, and bought the land several years later. After the fish were shipped out, the underwater zoo apparently sat vacant for some time.Demolition on the structure began March 19, 1962, to make way for a parking lot."